Is there a fantasy TV series as popular as Game of Thrones? Not many people I know watch it, but my aunt and I always discuss the episodes and my best friend got into it at the tail end of the last season. Even if you haven't watched the series, you're probably aware of at least one element to the show: dragons. 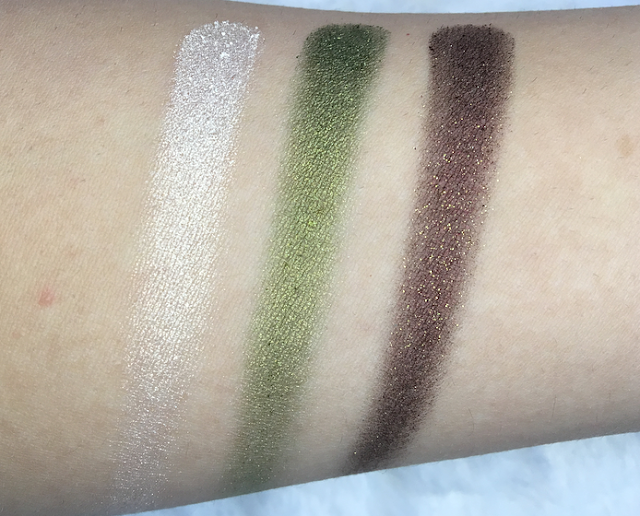 Three of them, to be exact, just as there are three shadows in this eyeshadow set from Strobe Cosmetics. The shadows are inspired by Daenerys's dragons Rhaegal, Drogon, and Viserion, and are named after the three and loosely based on the color of them. I've got to say that this set makes me feel like Daenerys Stormborn, Queen of the Andals and the Seven Kingdoms, Breaker of Chains, Mother of Dragons, etc. etc. The trio is $15, not bad at all as compared to MAC and Makeup Geek, and it comes in a velvet pouch which makes it feel both more luxe and more GOT-esque. The shadows are noticeably larger than other single-pan shadows, so you're getting more product for your money. 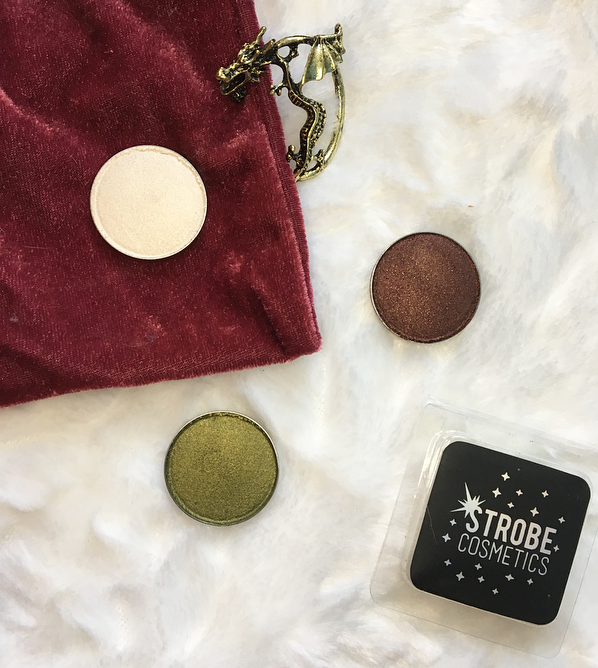 I've never ordered from Strobe Cosmetics before, but shipping was relatively fast considering they are an independent brand and I'm sure they've been overwhelmed with orders since this set has been featured on websites like Refinery 29. The three shadows are absolutely beautiful, both in formula and color. Drogon: dark burgundy/brown with gold glitter. I think Viserion and Rhaegal both have an amazing formula. They're so pigmented--I only needed to dip into Rhaegal once to cover the entire lid. Viserion makes a super bright inner-corner highlight. Drogon is just as pigmented, but has more fallout than the other two because of the glitter. The formula is really buttery. I think the duochrome aspect shows up the most with Rhaegal--I only notice it in certain lighting with Viserion. I think Viserion is probably my favorite shade--it's truly the perfect highlight and can be used with multiple looks, whereas a greenish-gold and dark glittery burgundy are harder to incorporate into my day-to-day neutral makeup. Overall, I think that if you like these colors, you won't be disappointed with how they perform. I'm often hesitant to order from smaller, independent brands but Strobe Cosmetics seems very promising. If you're a GOT fan--or just a fan of beautiful, unique shades--I would check out the Bay of Dragons set! What do you think of these shadows? Do you watch Game of Thrones? 22 comments on "Game of Thrones Inspired Eyeshadows"
We are fans of GoT and we are re-watching the first episodes at the moment. It's crazy because all characters are alive in the first episodes haha! Not many people I know watch it and I wish there was someone I could talk to at the end of each episode, so many new things happened worth discussing. And I cannot believe that we will wait one year and maybe more to watch the last season. Ah such a great idea, I love GOT! Love that highlighter shade, not sure I could wear that green! Such pretty shades, loving this post! I've never checked out Strobe Cosmetics but I'm going to take a look. Those shade are beautiful! I don't watch Game of Thrones but my husband does. Cool concept for eyeshadow shades. It would definitely get GoT fans excited. I do know quite a lot. Really beautiful shades! Perfect for the holidays..